Have they fixed the controller support yet? I haven't used a mouse/keyboard to play a PC game since Quake II. I've tried, but my brain refused to relearn. There was a time when Realtime Words' APB was planned for consoles, but as it fights for survival on PC retail and virtual shelves, it appears it still hasn't found the right publishing partner for a console version. Realtime Worlds Creative Director Dave Jones tells Eurogamer that a console version won't happen until it finds a publishing partner and works out several other logistics, including pricing and "running dedicated servers for console" MMOs. Jones mentions the company is going to remain "heavily focused on building upon" the PC version of APB. He also notes that a console version would require a redesign and that the studio's "immediate concern" is getting "new content out, updating the game and talking about what's coming next." so that means no console version then. I wouldn't mind playing this on PC as long as they fix their controller support. It is a fun game, and very ballsy. I just cannot play a game while sitting at a desk for long periods of time. I sit at a desk all day at work. I want to sit on my sofa when I'm home. 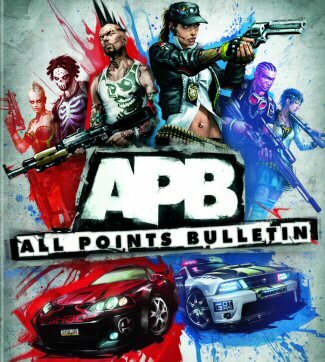 APB is getting super raped by reviewers. I can't say that I'm surprised. In my time with the beta I thought that the game had a lot of potential, but something was definitely missing. Given my experience with the beta, I would have agreed. But I just chalked all of the bugs and repitition to the fact it was a beta. I honestly expected critics to love the full release. The whole concept just oozes 'cool'. Now I'm curious to play the retail version just to see if they really didn't make that many improvements beyond the beta. Kind of missed the last weeks of beta and start of launch due to time constraints but have to agree, think the reviews are a little harsh and agree the game had a lot of potential but with the confusing payment options and unfixed bugs and glitches the game has rapidly gone of the radar. Being so long in production and amount of money invested in the game, i expected (and hoped) they would pull it out the bag. All Points Bulletin: Realtime Worlds Enters Into "Administration"
Realtime Worlds, developers of All Points Bulletin, has entered "into administration" which has been confirmed by Gamasutra. Entering into administration is indicative of the creditors seizing assets. The matter has not yet been adjudicated in court so it appears it is one step ahead of all-out court ordered bankruptcy. "A staffer for the PR house representing UK-based corporate recovery group Begbies Traynor said in a phone call that the firm is handling Realtime Worlds' administration, confirming reports that originally appeared on UK-based Develop Tuesday morning. An official statement is forthcoming, the rep said. As administrator, Begbies Traynor will decide whether Realtime Worlds can continue on as a company in light of financial difficulties, or more likely if the studio can recover more money by selling off assets or liquidating entirely." At this point, Gamasutra is reporting that calls to Realtime execs have not been returned. One bad MMO and they're in the toilet? EA is going to be in big financial trouble for the first time in a long time, and it may have to loosen its frosty death grip on its developers. There is going to be a reactionary emphasis on smaller, cheaper titles. Maybe a return of garage gaming? It'd be nice. If these things don't have an effect on the game industry as a whole they will at least have that impact on the MMO scene, which is probably the most stagnant genre out there right now. APB has 130,000 registered players, apparently, and the average player plays for four hours a day. Paying players average $28 per month, "a combination of game time and user to user marketplace trading". Administrator Paul Dounis said: "These are healthy numbers and reflect positively on APB as a ongoing concern. "They prove this is a very sticky and enjoyable game, which is shown by the average player daily playtime and an ARPPU (Average Revenue per Paying User) that is highest of any game out there." Realtime has suffered a torrid time in recent weeks. It went into administration following lackluster sales of APB, and is now up for sale. Last week sources revealed that staff were told whether they had lost their job via a PA system announcement, although Eurogamer has since been contacted by an ex-Realtime staff member to refute this claim. Reports suggest a new studio may arise from the ashes of the developer - one that will ensure social gaming project MyWorld meets its projected spring 2011 launch. Administrators claimed to have restructured the studio to ensure the game's future, promising a "pipeline" of future updates and game improvements. The Gears of War maker was "one of the companies in the frame", the BBC heard from a source. Epic's non-denial stirred the pot further. "Mark [Rein - Epic VP] absolutely loves APB, and everyone here loved what they saw," said spokesperson Dana Cowley. "We've got our hands full of Gears of War 3, Bulletstorm and the recently announced Project Sword. If any talks like that are going on, then they would be confidential." Epic Games supplied the Unreal Engine 3 technology that APB was built upon. But the friendship didn't stop there: Epic's Mark Rein even demoed APB to a PAX audience last year. APB creator and Realtime Worlds founder Dave Jones is believed to have relocated to the US. Coincidence? A Dundee development source told Eurogamer last night: "Dave Jones and Epic is quite the talking point in town. He and Mr Rein are good chums and have worked together on many levels for years and years and years. And he's not going to raise much money/staff here in the near future." Should the news hold water, the question will be why Epic has waited this long to make its move. Yesterday we heard that administrators will pull the plug on APB servers within 24 hours.